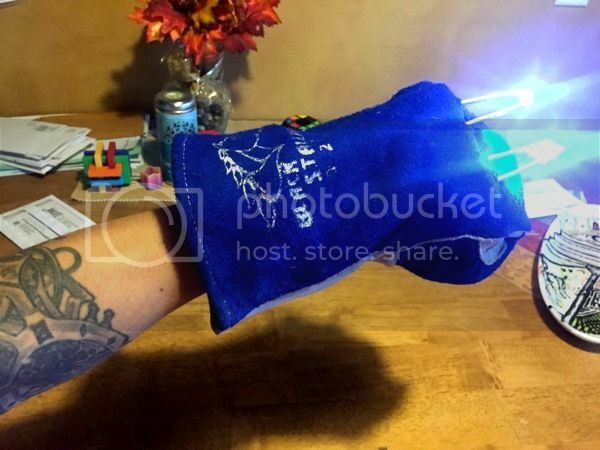 EXO taser Glove version 2.0. update from the O.P. 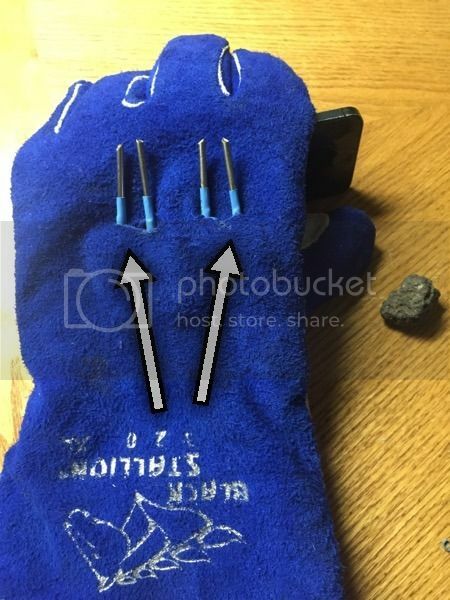 I removed the old junk from the bulky welding glove and made a frame that fits in the fist of most any glove(lefty of course). There is only one switch now to simplify things. This of course is just for fun. Not designed to be a actual weapon. I ordered some cheap High voltage generators from China a few months ago and I finally had some time to put something together. Sunday night I had to transition to a night shift so I had to stay up all night to be synced to work Monday night. This is the result. Let me preface this by saying this is a novelty item not necessarily used for a weapon. All the components in side the glove are locked in tight with epoxy so everything is pretty stiff. The wiring is very basic, simple momentary switch provided by redCowboy(I promised I would do something cool with them!) two HV buzz tubes from China. The "probes" are 1/8th" SS tig wire. The probes are epoxied into a solid thick block of plexiglass for insulation and stability. Both run off 1 18650 but in the photo a 18350 is used. One switch for each side. Squeeze both and they both turn on but can operate independently. Before everything was nice and neatly Velcrod into place. Rare earth magnets and pvc tubing make a temporary battery holder until the correct one comes in from Amazon. In an emergency the - lead is longer and can be yanked out if needed. To prevent a "Jacobs ladder" effect I added some heat shrink tubing. I'll be honest. I was terrified to put my hand I this and try it first. At 3:30am you decide screw it. I had another person to watch just in case. It's been long said never to work on HV projects alone. Here is an interesting link where the Little generators are discussed. 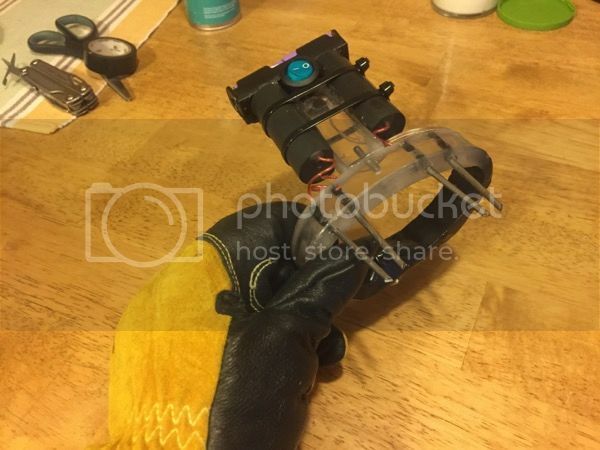 Re: Homemade taser glove! Note: very dangerous & potentially painful. Watch the current draw on them. 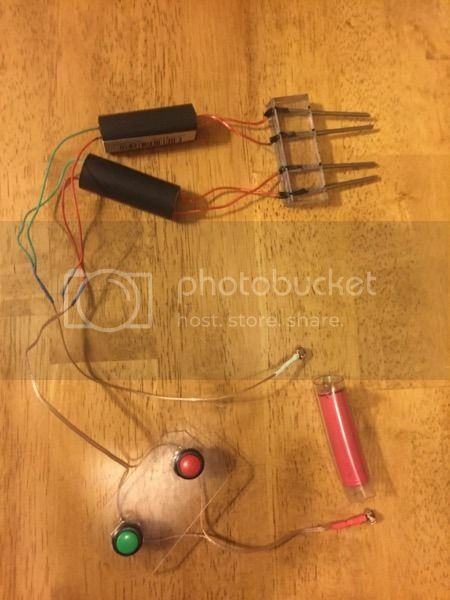 I got 3 of them, and at around 3.5v, the current starts running away and they draw a stupid amount, but the arcs are insane. It's pretty loud. Snap. crackle. pop. bite bite. Someone at work volunteered; he says him and his buddies tase each other all the time but I think he would change his mind. Nice! When you're not zapping bad guys, you can always do a little welding on the side. Those sound mean, I love it. Just stay out of the rain. Thanks for the compliments everyone! What else could I add to it? 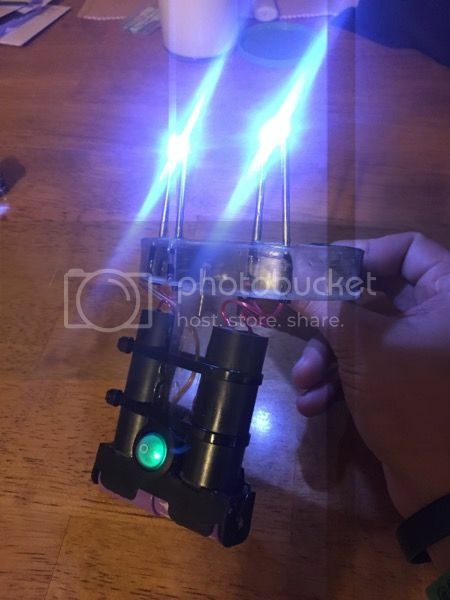 Maybe some leds in the fingers would be cool. add another pair and you will be wolverine. This is very nice and in no way are my comments following negative in any way. Your build it wonderful. Rolling out version 2.0 in the O.P.! Those look like fun....have you been bit yet? Nope. Not yet, there was a volunteer from work but he chickened out. I donno, should he sign a waiver? I think I should be the first if I built it. Maybe when the batteries are low but Right now it's running off 2 efest 18350s and the thing cranks. I wondered how much current they would draw so I tested one, these might sting a bit, I have not stuck my hand in it yet, of course the discharge spacing determines the charge prior to discharge, also they are not to be run shorted or open, so you need to set an arc spacing of 1/4 to 3/4 of an inch and limit runs to 60 seconds max. Operation voltage was marked as 3 - 6 volts on the pack. 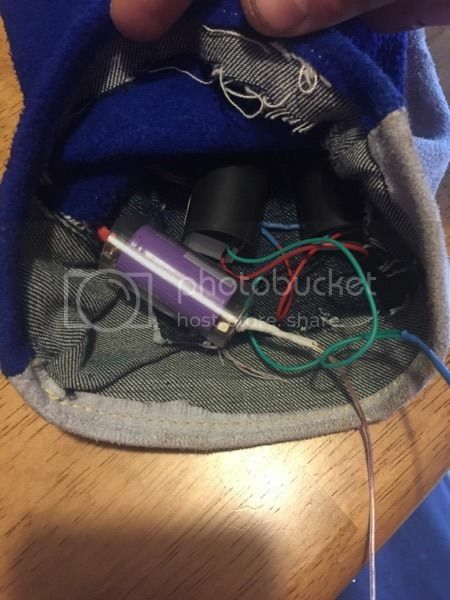 But they are fun, I bought a few so........maybe a zap stick with 3 or 4 down the business end spaced out and batteries in the handle?